Although Prime Minister Nawaz Sharif has termed the Peshawar attack a national tragedy, announced three days of national mourning and promised to eradicate the terrorists, real change won’t occur unless Pakistan discards the “good Taliban, bad Taliban” narrative and moves to decisively uphold the rule of law. The innocent lives lost in Peshawar are among a staggering 50,000 civilians killed by the Taliban and their aligned groups in Pakistan since 9/11. Such civilian attacks have intensified in the last five years. The Tehrik-i-Taliban Pakistan (TTP) said it carried out the Peshawar school attack in retaliation for the Pakistani army’s ongoing military offensive against the Taliban. “This is a reaction to the killing of our children and dumping of bodies of our mujahideen [jihadis],” said a spokesman. The attack on the Peshawar school is actually a measure of the success of the operation that was belatedly launched in June this year as it indicates the desperation of the Taliban, who had already been badly affected by America’s drone strikes. Many Pakistanis and allies in other countries like the U.S. have been demanding a decisive move against the Taliban and their aligned groups for years, but the army and government kept putting it off due to “lack of political consensus.” Leaders like former cricket hero Imran Khan have added to the confusion. Khan will condemn the Taliban but then also justify their actions by saying that they are acting in response to drone strikes or American imperialism. This confusion has been perpetuated by the talking heads given space in various media outlets. They are tasked by what I call the “Dirty Tricks Brigade” — the psychological operations department of the intelligence agency — with crafting and sustaining a national narrative about the “ideology of Pakistan” that allows the armed forces to retain their supremacy in Pakistan. Those who challenge this “ideology” are dubbed traitors and enemies of Islam. This religious patriotism is a part of Pakistan’s history. The Peshawar school attack took place on a day that Pakistan commemorates as a “black day,” the anniversary of its defeat in 1971 at the hands of rebels in then East Pakistan, aided by India. The delusional nature of those guarding Pakistan’s geographical and ideological frontiers is clear in the front page of the daily Dawn on Dec 17, 1971, the day after the Pakistan army’s ignominious surrender in Dhaka. 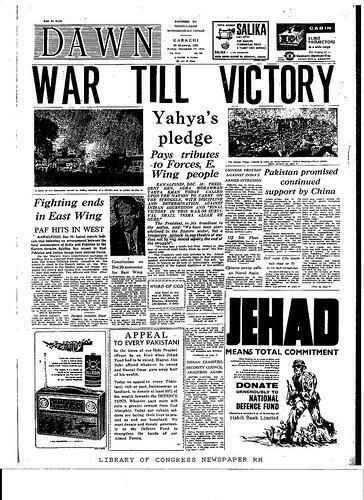 A banner headline reproduced the then military dictator Gen. Yahya Khan’s pronouncement — “WAR TILL VICTORY” — while a front-page advertisement glorifying “JEHAD” (holy war) sought donations to the National Defense Fund. The next military dictator, Gen. Mohammad Zia ul-Haq (1977-88), strengthened the conflation of patriotism with religion as he made Pakistan into a frontline state in America’s war against the “Godless Communists” in next-door Afghanistan. The “mujahideen,” or “holy warriors,” of that time later morphed into the Taliban, fueled by an ultra-orthodox version of Islam stemming from Saudi Arabia that sees all others as non-Muslims. The next military dictator, Gen. Pervez Musharraf (1999-2008), was secular and dabbled with trying to reverse Zia’s legacy, but he was too caught up in running with the hares and hunting with the hounds to decisively tackle the extremists who by then had begun to run amok in the country. The confusion in Pakistan has grown with the security forces perpetuating the narrative of “good Taliban” and “bad Taliban.” The “good Taliban” were those who didn’t attack Pakistan. They were “non-state actors” and “strategic assets” useful to further Pakistan’s “strategic depth” in Afghanistan or attack targets in “enemy” India. Pakistan banned the Lashkar-e-Tayyaba (LeT), which is known to be behind the horrific attacks in Mumbai in November 2008, but allowed it to function as the “charity organization” Jamat-ud-Dawa (JuD), which openly holds rallies in major cities like Lahore and keeps the anti-India narrative alive. The LeT and other groups of Punjabi Taliban are known to be behind the target killing of Shias in Pakistan, against whom slogans of “kafir” (infidel) began to be raisedduring the Afghan war. Pakistan has also tolerated militant attacks on Ahmadis and taken no action against banners and posters in public places that openly call for attacks on this sect, constitutionally declared as non-Muslims by the Zulfiqar Ali Bhutto government in 1974. Ten years later, the Zia regime criminalized their expressions of faith as Muslims. The Peshawar attack won’t prevent future attacks unless the Pakistani government upholds the rule of law and prosecutes murderers. The Pakistan government has yet to prosecute those who are already in custody on terror charges, like the two attackers in the Ahmadi attacks of 2010, captured by Ahmadi worshippers and handed over to the police. Although charged under the Anti-Terrorism Act and still in custody, they have yet to be punished. The police need to be strengthened, empowered, trained and equipped to counter organized crimes at the local level — including kidnappings for ransom, car thefts and robberies. Many of these crimes actually enrich the militants in the larger “war on terror.” Often suspects nabbed by police are released or acquitted by courts due to “lack of evidence.” Weaknesses in the prosecution are exacerbated by lack of a witness protection plan. The Pakistani army will continue its offensive against the Taliban in North Waziristan. But on the civilian side, will leaders — including cricket star Khan — step up to the plate and unite with the government against the common enemy? Will they be able to follow up and change the national narrative? This must happen to ensure that tragedies like this murder of innocent children never occur again.